Keeping notes on one’s health has been shown to be a tool for improving it,1 but up until now there has been no measure of how many people engage in this activity. 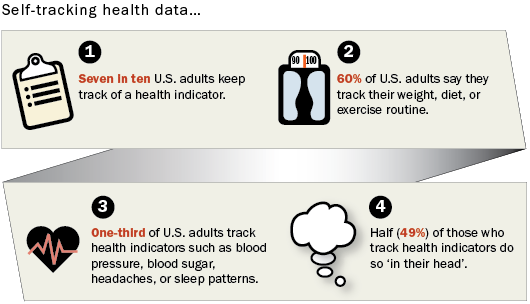 A national telephone survey conducted by the Pew Research Center’s Internet & American Life Project finds that 69% of U.S. adults keep track of at least one health indicator such as weight, diet, exercise routine, or symptom. We will refer to this group as “trackers” throughout this report. There were significant differences between the 50% of trackers who record their notes in some organized way, such as on paper or using technology, and the 44% of trackers who keep track solely “in their heads.” We will note the differences in each section that follows. 45% of trackers with 2+ conditions use paper, like a notebook or journal, compared with 37% of trackers with 1 condition and 28% of trackers who report no chronic conditions. 22% of trackers with 2+ conditions say they use a medical device, like a glucometer, compared with 7% of trackers with 1 condition and 2% of trackers who report no chronic conditions. At the same time, many trackers living with chronic conditions say they keep the data “in their heads.” Thirty-seven percent of trackers with 2+ conditions say they keep their progress notes “in their heads,” as do 48% of trackers with 1 condition and 54% of trackers who report no chronic conditions. Half of trackers (49%) say they update their records or notes only occasionally, when something comes up or changes; half (46%) say they update on a regular basis. Thirty-four percent of trackers say they share their records or notes with another person or group, either online or offline. Of those, half (52%) share with a clinician. Not surprisingly, trackers who do not take formal notes are less likely than others to say they update their records on a regular basis or to share their progress with someone else. 54% of trackers with 2+ conditions update their notes on a regular basis, compared with 46% of trackers with 1 condition and 43% of trackers who report no chronic conditions. By comparison, 35% of trackers with 1 condition share their notes; of those, 57% share with a clinician. Thirty percent of trackers who report no chronic conditions share their notes; of those, 37% share with a clinician. In all, 63% of trackers agree with at least one of those statements of impact. 56% of trackers living with 2+ conditions say it has affected their overall approach to maintaining their health or the health of someone they help care for, compared with 40% of trackers who report no chronic conditions. 45% of trackers living with 2+ conditions say it has affected a decision about how to treat an illness or condition, compared with 25% of trackers with no chronic conditions. 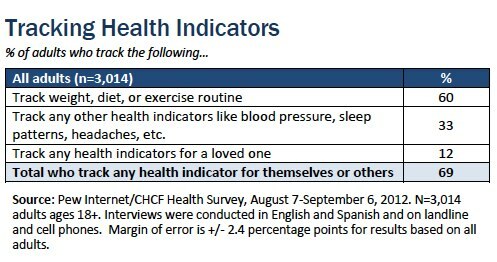 Three-quarters of trackers with 2+ conditions (76%) agree with at least one of those statements – only 24% say that tracking a health indicator hasn’t affected their health in any of these ways. Fully 68% of trackers with 1 condition report at least one of the three impacts, compared with 55% of those who report no chronic conditions.